These draperies are beautiful. The fabric is silky and the back is lined like custom draperies. You have several options for hanging them on the rod. They truly make a statement of sophistication and style. You will love them. They are true to the picture in looks and sized perfectly. Take in the beautiful colors, sumptuous patterns, and a handy light-blocking lining of this printed faux silk taffeta blackout curtain. Showcasing your choice of a blue/white or dark/grey white color scheme, this design also boasts a highly distinctive and undeniably fashionable fusion of floral and geometric themes. Small: 50 inches wide x 84 inches long / weighs 12 lbs. Medium: 50 inches wide x 96 inches long / weighs 13 lbs. Large: 50 inches wide x 108 inches long / weighs 14 lbs. XL: 50 inches wide x 120 inches long / weighs 15 lbs. Wonderful, heavy weigh fabric in beautiful colors. I love how this brightens up the room! Received many compliments on it and highly recommend it! You'll love them!! I love the feel of the fabric, it's very thick and soft. The color is more of a dark gray. I really wanted the royal print, I wanted a color that would pop with my dark gray furniture. 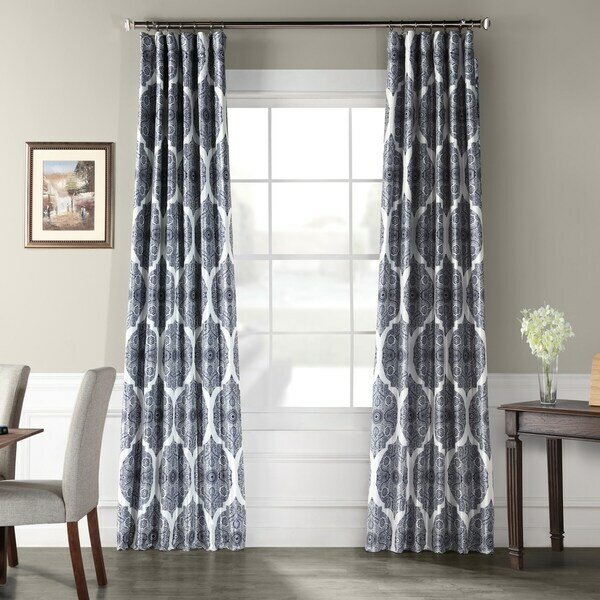 I decided to keep them, its hard to find great curtains, and the style if very nice. I get lots of compliments. I love everything about these drapes. I hung them with rings but the pockets would look great too. The fabric and weight is high quality. Best purchase ever! These curtains are heavy and beautiful. I couldn't be happier. "One panel or two included?" "Do the blue curtains strictly blue and gray or is there some black in them?" The blue option only has blue while the black option only has black. "If you use the rings on the curtain rod how do they attach to the curtain?" To attach the curtain to rings you will need drapery pins/hooks or rings that have clips attached. The pins/hooks are inserted directly into the back of the header.